Do I need to specify a date I wish to use the Universal Orlando™ 3 Park Explorer Ticket? No, you will receive an open-dated Universal Ticket. Your Universal Orlando™ 3 Park Explorer Ticket is activated the first time you visit one of the parks or one of the select live entertainment venues at Universal CityWalk™. 2019 tickets must be activated on or before 31 December 2019. Does the Universal Orlando™ 3 Park Explorer Ticket expire? Yes, the Universal Orlando™ 3 Park Explorer Ticket expires after 14 days from first use irrespective of how many times the ticket has been used. Unused days shall be forfeited. Can I visit all three parks in one day? 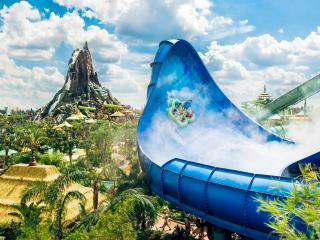 Universal’s Islands of Adventure™ and Universal’s Volcano Bay™ Water Theme Park. At Universal CityWalk™ some of the venues require you to be aged 21 years or above and photo ID is required. Ticket is also not valid for separately ticketed concerts and special events at any of the Universal theme parks or within any of the Universal CityWalk™ venues and does not include admission to AMC® Universal Cineplex 20 with IMAX®, the Blue Man Group show or Hollywood Drive-In Golf™. TRANSFORMERS and its logo and all related characters are trademarks of Hasbro and are used with permission. © 2019 Hasbro. All Rights Reserved. © 2019 DreamWorks LLC and Paramount Pictures Corporation. All Rights Reserved. THE SIMPSONS RIDE TM Twentieth Century Fox Film Corporation. The Simpsons TM & © 2019 Twentieth Century Fox Film Corporation. All rights reserved. © 2019 MARVEL. © 2019 BMP. Blue Man Group Photos by Lindsey Best.. Universal elements and all related indicia TM & © 2019 Universal Studios. All rights reserved.